The Calgary Zoo's whooping crane captive breeding program has reached another milestone. Two young whooping cranes hatched at the zoo's Devonian Wildlife Conservation Centre are about to be released into the wild in the southern United States. The juvenile birds were sent to the Audubon Species Survival Center in New Orleans. They're now at the Rockefeller Wildlife Refuge in southwest Louisiana, being acclimated to their new surroundings — along with 10 other young cranes from Wisconsin and Maryland — before they're all turned loose in coming weeks. Another 11 juveniles from Wisconsin were also brought to the White Lake Wetlands Conservation Area — about 32 kilometres north — earlier this month to begin a similar adaptation. The 23 birds will remain in a large pen to protect them from predators. Other birds will be able to fly in and when they're ready, the cranes will fly out. Valerie Edwards, a zookeeper in Calgary, says she's been getting updates since the two cranes arrived and it seems so far things are going well. "I was told that Sulu — she's the younger of the two birds we sent down, she's a little female — she's a little smaller than the other birds just because she's one of the youngest in this particular cohort. But apparently she was the feistiest of them all," she said. "She kind of came out of the crate, ready to go. So I think that's a great thing to hear because hopefully that helps her out in the long run when she's released." The zoo also hatched two other whooping crane chicks this spring — a male and a female — which remain in Calgary. The female will become part of the breeding program in a few years and keepers haven't determined if the male will be bred or if he'll go on display. 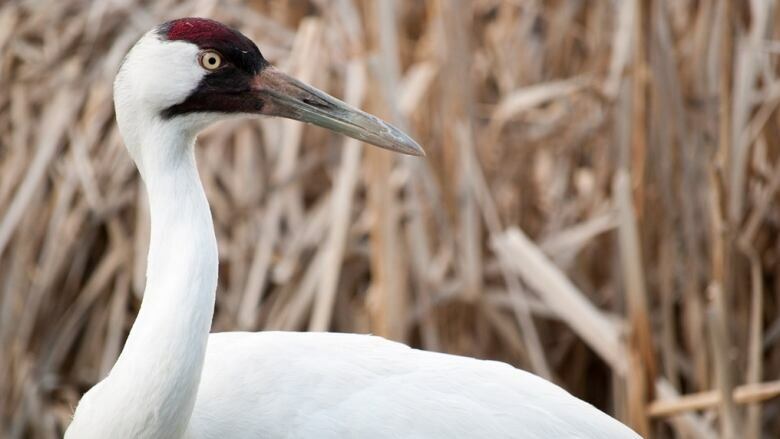 Whooping cranes are among the world's rarest bird. In 1944 there were just 21 alive, a number that has grown to about 600 today — around 450 in the wild and about 150 in captivity. Nearly 350 of the wild birds form the only natural flock, which migrates between Canada and Texas. The remaining 100 are in a flock taught to migrate from Wisconsin to Florida by following ultralight planes. Standing nearly six feet, they are the tallest flying bird in North America.